On Aug. 4, Bill Welch of Tulsa concluded a special journey in ministry that began in Spring 2007. Saint Paul School of Theology congratulates him for graduating from that United Methodist seminary’s Course of Study (COS) program for Local Pastors. He’s been pursuing that education almost as long as he’s been pastoring. In mid-life, he began serving West Tulsa UMC part-time, a bivocational appointment. The year was 2006. Full-time pastoral ministry and full-time COS coursework began for him two years ago, serving both West Tulsa and Tulsa-Grace, small-membership churches. The first class convinced him this educational path was right for him. Due to its subject, "I was blessed to understand small-church culture," Rev. Welch said. "COS classes are very applicable to mid-life, non-seminary-trained people pastoring small churches." 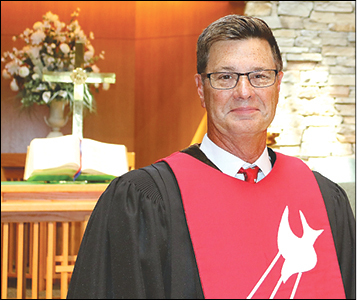 Welch continues to lead West Tulsa UMC, which last year welcomed 10 people by Profession of Faith and averaged 118 in worship; and Tulsa-Grace, reporting a new member by Profession of Faith and averaging 40 in worship last year. The Local Pastor previously worked 30 years as a commercial photographer and five as a development director. While a bivocational pastor, he also worked for a nonprofit camp. The Tulsan chose to attend Saint Paul because that school offered the nearest COS program, he said. Travel to the seminary’s campus in Kansas City brought chances to visit a daughter and her family in Lawrence, Kan., too. Saint Paul School now offers COS in various formats, including classes in Oklahoma City. The August graduation ceremony was held in Wesley Chapel at UM Church of the Resurrection, Leawood, Kan.
Find information about Course of Study at http://www.okumc.org/localpastors.